Complete the Trisuli, finishing the day on the 'Pin Ball' rapid. Transfer to and overnight in Pokhara. We load up the bus again and head to the Madi Khola (grade IV). After a short trek, with porters carrying all the equipment, we paddle some great whitewater down to our evening camp at Bhaise. Paddle the Madi Khola to Karputar. Eddy-hopping heaven with very few portages and awesome views of the Himalayan mountains. Today its a fairly gentle class two paddle down to Damauli. Time to play and enjoy the gorgeous valley scenery. Return to Pokhara for early evening. Free time in Pokhara for sight seeing, shopping or sitting by the lakeside in the sunshine with a cold drink. 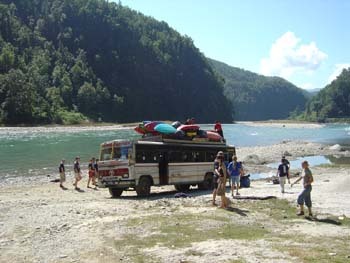 Drive to Baglung for the start of the Kali Gandaki (IV-/IV) and put on the river. After 2kms of warm up paddling its straight into 2 big grade IV rapids  Big Brother and Little Brother. More brilliant whitewater and more playing. We have a lot of spare time on this trip so it can be used to maximum effect by taking every play opportunity there is. Paddle down to the take out at the new dam then transfer back to Pokhara for the night. After breakfast we load our bus and head back to Kathmandu allowing us time to enjoy a little of the Kathmandu experience. An early breakfast before our bus heads east to the Upper Sun Kosi (grade III+), giving great views of the snow-capped mountains along the way. We spend the night at the quiet Riverside Resort. The Balephi (grade III+) is a great fun, low volume river that makes a change from the large volume rivers paddled so far. After the river we head up to the Last Resort, and a chance to enjoy a sauna to help ease those aches and pains. Today it's kayaking at it's very best - the Bhote Kosi (grade IV+/V)! This is a much more intense and demanding river, and will be a good test of your previous two weeks paddling skills. We'll be enjoying a well earned beer back at the Last Resort after this one! After a lazy morning it's back to the hustle and bustle of Kathmandu.